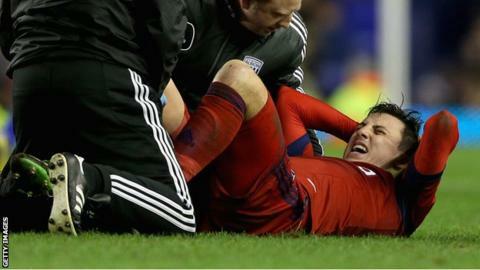 West Bromwich Albion midfielder George Thorne will be out for up to eight months with a serious knee injury. Thorne, 20, suffered the injury during Wednesday's 2-1 defeat at Everton, only his fourth league start for the club. Tests have since revealed Thorne, who has had loan spells at Peterborough and Portsmouth, ruptured the anterior cruciate ligament in his right knee. "He will be out of action for six to eight months," a West Brom spokesman said. Thorne is a product of the Baggies academy and made his first-team debut during the 2009-2010 season aged just 16 and 328 days. West Brom manager Steve Clarke said: "This is really sad news - both for George personally and for the club as a whole. "George is a talented young midfielder who has underlined his potential by doing really well for us in recent weeks."